It was twenty years ago today that Norman Veber formed the club to play... Okay, okay. Bad pun, I know. For MAMA's twentieth anniversary, we wanted to feature a model that was not only built in the period that MAMA was formed, but which also exemplifies the contemporary building style of the day. Lyle's 1939 Ford convertible fills the bill on both counts. Starting with an AMT 1940 Ford kit, Lyle removed the roof and massaged a Carson top from a Testor's 1948 Ford to fit. He also filled the trunk lines and engraved new rumble seat lines to give his car a subtle difference. 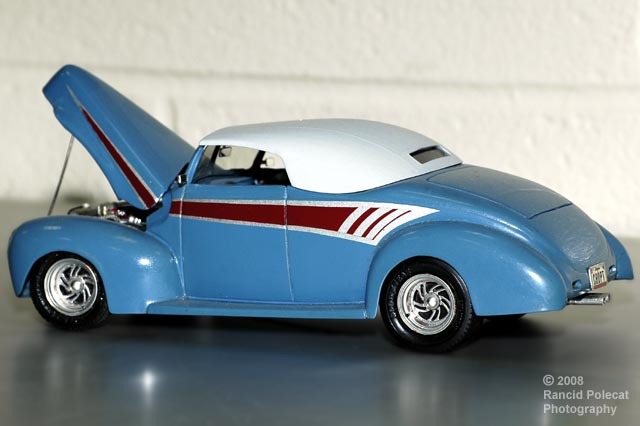 The wheels and tires came from the new-at-the-time Revell 1937 Ford Street Rod kit.